Filmmaker Brett Gaylor explores issues of copyright in the information age, mashing up the media landscape of the 20th century and shattering the wall between users and producers. Promotion is an essential skill for every beginner DJ that wants to become successful. Promotion allows a beginner DJ to make their way from the bedroom to the real events at clubs and festivals. The internet gives the beginner DJ great opportunies which were once a hassle and downright cutthroat. By promoting your mixes on Youtube, you will be able to gain a broad audience and following, eventually guaranteeing your success. This post shows you a few tips and tricks on how you can promote your DJ mix on Youtube. ChantalHarvey — Beyers and the ReZtones played live, at Metanomics 100th Episode Bash! I filmed a very special thank you-song, in which Beyers Sellers sings the names of the people involved in 100 episodes of Metanomics. The gig was held on April 14, 2010, in Muse Isle - which is celebrating it s 4 years party on April 15, 2010. A special word of thanks to JenZza Misfit. JenzZa Misfit 's - Muse Isle in Second Life™ celebrates 4 years of existence April 11th through the 15th, with 5 days of LIVE music events & festivities ! On April 15, 2006 - Muse Isle was placed on the Second Life grid and became one of the metaverse's first LIVE music performance venues. The September 7, 2006 issue of Rollingstone Magazine gave mention to our globally recognized ' Arena at Muse Isle '. Join us for the beginning of the future as we honor the past ! Thursday April 15th - The Actual Birthday Day - Finale !! You Have 0 Friends - South Park, Facebook, and Tron!! Last night's new episode of South Park, "You Have 0 Friends" is now uncensored! Watch it now! The internet is heating up with news about the Ipad, Apple’s new touch screen interface. Between rave reviews from some and boo’s from others that are calling it a giant iphone- you are probably wondering, but can I dj with it? 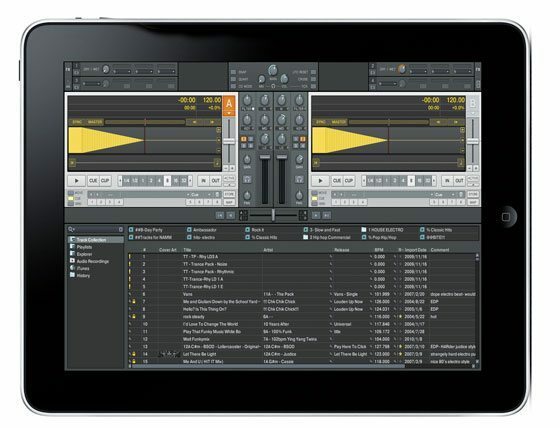 Lets take a look at what might actually be possible with the new ipad, and if it cant replace your dj laptop- perhaps it might be the low cost touch controller you have been waiting for? 10 hour battery life means you can play without being plugged in at all. one model boasts a 64 GB hard drive which can hold a fairly large dj set. Light and very portable, 1.5 pounds, 9.56 x 7.47 x 0.5 inches. Third party hardware developers will be able to create sound card breakouts that improve the audio quality. Comes with a 1/8th” standard headphone out. third party hardware developers will need to pay apple high royaltys to develop products for the platform. This will drive up costs and limit development. A USB port would have solved most of this. not ideal, but it is a potential work around. Audio will be written and read from the flash drives directly. While solid state drives are blazing fast, can they deal with highly demanding audio process like djing on their own? We really have no idea- but suspect it might be a stretch. These are designed to stream one song at a time, not four with keylock and effects. Its highly unlikely the Ipad offering will come close to replacing your laptop anytime soon. It is however very realistic that third party developers will port over in-expensive touch apps that will transform this low cost device into a very handy touch screen controller. The trouble remains getting that control data to the computer over bluetooth or wifi without dropouts or latency. This certainly is an exciting announcement for the computer world but not quite the groundbreaking news for djs that some might have hoped. Looking for more information? Here are few interesting articles on the I-Pad subject. Check out that DJ and Sampler controller! ARCADE BUTTONS! In a battle that's been ongoing since the fall of 2007, Comcast just won the latest round against the Federal Communications Commission. A federal appeals court announced its decision this morning to grant ComCast a petition for review, vacating the order by the FCC, which imposed a "net neutrality" on the nation's largest cable company. The decision appears to focus on the FCC's legal authority to enforce net neutrality and not on the legality of net neutrality itself. The case began when "several subscribers to Comcast's high-speed Internet service discovered that the company was interfering with their use of peer-to-peer networking applications," the decision reads. Comcast argued that its move to block p2p file-sharing was "necessary to manage scarce network capacity", but the FCC found differently, ruling that the company had "significantly impeded consumers' ability to access the content and use the applications of their choice". The FCC's decision to sanction Comcast for its 2007 P2P blocking was overruled today by the US Court of Appeals for the DC Circuit. The question before the court was whether the FCC had the legal authority to "regulate an Internet service provider's network management practice." According to a three-judge panel, "the Commission has failed to make that showing" and the FCC's order against Comcast is tossed. When the complaints against Comcast first surfaced, they noted that the company was violating the FCC's "Internet Policy Statement" drafted in 2005. That statement provided "four freedoms" to Internet users, including freedom from traffic discrimination apart from reasonable network management. The FCC decided that Comcast's actions had not been "reasonable network management," but Comcast took to the agency to court, arguing that the FCC had no right to regulate its network management practices at all. The Internet Policy Statement was not a rule; instead, it was a set of guidelines, and even the statement admitted that the principles weren't legally enforceable. To sanction Comcast, the FCC relied on its "ancillary" jurisdiction to implement the authority that Congress gave it—but was this kind of network management ruling really within the FCC's remit? The court held that it wasn't, that Congress had never given the agency the authority necessary to do this, and that the entire proceeding was illegitimate. The FCC's "Order" against Comcast is therefore vacated; Comcast wins. Could Comcast Derail the National Broadband Plan? President Obama has made broadband a key part of his telecommunications agenda. To get there, he has tasked the Federal Communications Commission with the responsibility to make changes to Internet regulations and promote his "National Broadband Plan," an ambitious effort to reform the industry and expand broadband access across the country. There's an elephant in the room however, and its name is Comcast. The telecommunications company is challenging the FCC's authority on Internet regulation in court, and if successful it could seriously inhibit the agency's efforts to move its plans forward. Comcast's beef goes back to 2008, when the FCC censured the company for its bandwidth-throttling efforts against BitTorrent and others. Comcast on Tuesday won its federal lawsuit against the Federal Communications Commission in a ruling that undermines the agency's ability to regulate Internet service providers just as it unrolls a sweeping broadband agenda. The decision also sparks pressing questions on how the agency will respond, with public interest groups advocating that the FCC attempt to move those services into a regulatory regime clearly under the agency's control. The U.S. Court of Appeals for the District of Columbia, in a 3-0 decision, ruled that the FCC lacked the authority to require Comcast, the nation's biggest broadband services provider, to treat all Internet traffic equally on its network. In 2008 Comcast was ordered to stop slowing down BitTorrent users by preventing them to share files with others. In addition, the company had to disclose all “network management” practices. The whole Comcast debacle ignited a discussion about Net Neutrality and eventually led to the FCC’s national broadband plan which was released last month. Today, the Court of Appeals overruled FCC’s decision in the Comcast case, with three judges stating that the commission doesn’t have the authority to require IPSs to keep their network neutral. After appealing FCC’s decision in favor of BitTorrent users, Comcast has finally got the verdict (pdf) it wanted. Although it seems unlikely that the ISP will pick up its old habit of preventing BitTorrent users to seed files, it could in theory do so. Does the Internet promote freedom of expression and communication, making it a catalyst for democracy and activism? Is the net tilted towards Democracy and participatory society? Meanwhile, do services like Facebook and Twitter encourage virtual and superficial involvement over dedication to the kind of activism that makes a difference? Does it just take people off the streets, blogging safely in their homes where they no longer threaten repressive regimes? Digital Nation – Life on the Virtual Frontier (2009 – 2010) is a documentary film by Rachel Dretzin and Douglas Rushkoff that thematizes the media issues in the context of our virtual lives, tech development, networking and multitasking. Chapter 1: Distracted by everything. M.I.T. students are among the world’s smartest and most wired. They constantly multitask with their tech tools. Chapter 2: What’s it doing to their brains. Tests given Stanford’s multitaskers yield troubling discoveries. Other research into Net use and the brain raises more questions. Chapter 3: South Korea’s gaming craze. Some cautionary lessons from a country where Internet addiction has become a health crisis. Chapter 4: Teaching with technology. Teachers are embracing digital media–’it keeps students engaged; new skills are needed for a new age.’ But is there a catch? Chapter 5: The dumbest generation? The debate has just begun on whether we are losing as much as we’re gaining in 24/7 wired world. Chapter 6: Relationships. Millions of people are inhabiting the Net as it were a real place, satisfying the urge to connect to others in online games, virtual worlds. Chapter 7: Virtual worlds. Second life offers a totally new reality for humans, says it’s creator–and IBM has begun shifting it’s meetings into this virtual space. Chapter 8: Can virtual experience change us? The U.S. military is using virtual spaces for PTSD therapy and for flying drones in Iraq while based in a room in Nevada. Chapter 9: Where are we headed? A school is organized around learning through video games–may be it’s students are getting something we aren’t yet able to measure or recognize. Machinima, which refers works that use real-time 3-D graphics engines to generate computer animation, could have presented a special problem for Second Life, where every individual object in view is potentially a different person’s intellectual property. Getting permission from so many owners of IP in order to create a machinima is potentially nightmarish. Instead of running from the new kinds of fair use enabled by new technologies, Linden Lab has embraced them. The new license allows Second Life users to reserve the rights to their creations by placing them in areas that are not publicly accessible. Second Life makes tools available to users that allow them to restrict access to their Virtual Land and its contents. The rules are simple and intuitive: if you don’t want people taking pictures of your floating city/dancing bear/epic space opera, don’t leave your floating city/dancing bear/epic space opera in a public place. Linden Lab’s behavior should be an object lesson to movie studios and major record labels, who have alienated their own fans by trying to thwart new fair uses as they come along, whether through DRM or DMCA takedowns. Linden Lab has shown that there are innovative new ways to give the green-light to fair uses while still giving users the freedom to protect their creations. We hope that movie studios and major record labels are taking notes, because Linden Lab is showing them how it’s done. spyvspyaeon — "Lunar deity is a god or goddess associated with or symbolizing the moon. These deities can have a variety of functions and traditions depending upon the culture, but they are often related to or an enemy of the solar deity. Some cultures relate the moon as a Female, although is known as a male more common worldwide. The Moon through the edges has been a significant inspiration and creativity of many artists around the world. SlimGirlFat as achieved a great song and the starting inspiration to this creation. Lunar Deity is represented on this work as the Dryad connecting the entity with the nature. I should frame this work between both of their own simplistic and the complex of its composition but I rather leave you the final judgment. don't blame me ツ. Inspired by Enigma video clips (I'm a big fan of them) I've tried an approach to a SL Machinima to their kinda videos. This video is nothing more than a thought caught in no where place no where in time, some sort of a let it flow (with some few basic knowledge). Most of the special fx's are made on After effects and I want to mention that the glass breaking on the start it's a precomposed set already build on 3DS max and exported to AE, royalty free. The rest I just applied a bunch of coolest effects build by my own, from foam through cc cylinder (warp drive) and some 3D depth field with some motion blur. I hope you enjoy so much as I this new release. " This is a Collaborative work between SlimGirlFat and spyvspy aeon. In what could only be a spiting vengeful move to cause confusion and mass panic across the grid, Linden Lab has announced that "Role-Playing" is now an unacceptable form of use inside the virtual world platform Second Life. All inworld role-play avatars and groups must cease and desist. Linden Lab says that the bold move was due to "persistent user complaints." Many users were simply unsure if the avatar he or she was talking to was really real or not. Other new Second Life users simply did not understand the concept of an 'avatar' and therefore Linden Lab wanted to make SL an experience everyone can comprehend. Several Linden Lab employees seen inworld were overheard saying "first we're banning the Goreans, then the dragons, then the steampunk freaks, then the vampires, then the furries, then the tinies... we'll leave the prostitutes for last... because we'll need proof first that is not their real life profession." "All residents must be who they truly are in real life. Any Second Life user who is caught not being who they are in real life may result in suspension or account termination. Linden Lab will begin enforcing this policy effective immediately." 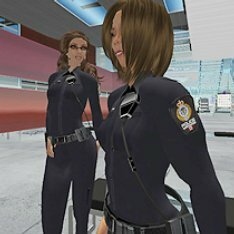 Linden Lab employees dressed their avatars in police officer's uniforms to show a public display of authority inworld and went swarming across the grid with tazers in hand. The first role-play group targeted were... basically... all "avatars"... who have since had their homes derezzed and their groups deleted.